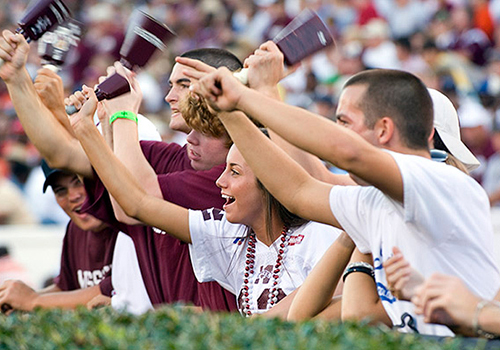 Mississippi State University Bulldog fans shake the school’s traditional cowbells at football games. Cowbells are a Game Day top-seller at the school’s campus bookstore, rung at the stadium, tailgates and at home watch parties. With 80 percent of students saying they watch away games with friends, family, or other college football fans, the homegating phenomenon created an opportunity for Barnes & Noble College to again put the needs of its customers, front and center. “With all of our marketing efforts, we use our students as our reference point and asked them, if they can’t attend the game, what kinds of ways they might participate in a social, collaborative atmosphere,” Lenihan explains. Part of that discovery was from the Barnes & Noble College audience. The term homegating didn’t have much resonance. Sixty-seven percent didn’t recognize that term, so we wanted a way to introduce the opportunity to connect with students and help them bring their own individual celebration to their dorm or home event,” she adds. As a result, this fall, Barnes & Noble College launched an addition to their highly successful True Spirit program with ‘Bringing the Game Home,’ a selection of merchandise and college apparel designed to cater specifically to the at-home audience. “It’s a large selection of products that in many cases we haven’t carried before,” explains Shannon Albers, Email Marketing Project Manager. “So our marketing was directed at our different audiences — students, parents and alumni — introducing them to a collection of different products, all customized to their particular school,” she says. 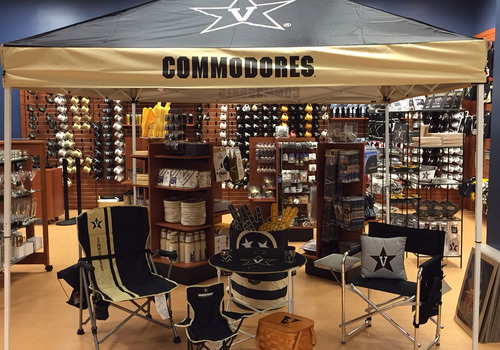 The Barnes & Noble at Vanderbilt University Bookstore displays an assortment of tail-gating items for Commodore football fans within the store. The thinking behind the expanded product offerings was to cater to the wide base of fans entertaining at home represents. “A lot of this movement is alumni driven, graduates who crave ties to their old school and faithfully follow their teams — often a long way from the school’s campus,” explains Barnes & Noble College Buyer, Stephanie Voorhees. She points to top-selling items such as cutting boards, dishes and drinkware that have particular appeal for that group, as opposed to her student fan base, who may be more inclined towards hair bows, face tattoos and jewelry. For those alumni and parents who can come to campus for home games, many Barnes & Noble College store managers recognize that opportunity with the chance to host special events at their stores. “The idea is to really help them feel at home and enjoy the game the way everyone else on campus does,” Lenihan says. Like Mississippi State, many managers arrange for the game to be aired in-store and even hold family-themed pep rallies to learn the cheers and anthems of the school so they can be true fans on game day. 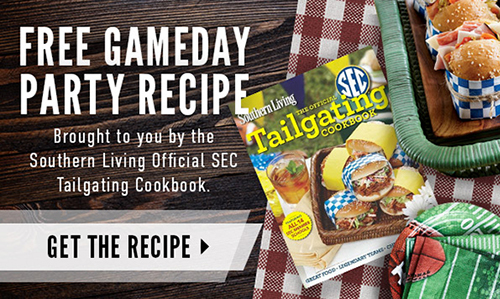 Included in the student email program were other ways to help fans enjoy their party experience, including recipes from the Southern Living Official SEC Tailgating Cookbook. The ‘Bringing the Game Home’ program started in late August and ran through October, and the results were impressive. “Emails to our parents and alumni received a 52 percent open rate and 5.5 percent click rate,” Albers explains. “It’s a strong indication that they’re really interested in the kinds of programs and products we offer.” But the program isn’t just designed to support college football. “Our schools represent a variety of sports markets, and the beauty of this program is that it translates equally well to basketball, hockey, soccer — even baseball,” Lenihan notes.